The first of two planned vegetable beds, installed 2 weekends ago. What’s in there? Spinach (bloomsdale long standing, greyhound) and lettuce (romaine, salad bowl red, arugula, black seeded simpson), both nursery grown and my own, as well as kale (winterbor) and broccoli (blue wind) seedlings. Peas (sugar snap and progress for shelling) will go in the front, along with some scaffolding, as soon as they sprout next week. You may have noticed the yellow lines and asphalt at the top there. Yes, this is in my front yard about 4 feet from the street. Why the location? Unfortunately, it’s the only place that gets full sun from early morning to night. And I’m new in town, so I like to make a good first impression. Why, the folks in the many cars passing by are all probably saying “Well done! You’ve taken away eye-pleasing shrub and flower space, put a rudimentary pine box in there and reclaimed that space to grow some food.” Sure they are. More on this little experiment to come in future posts. For documentations’ sake: started tomato, pepper and beet seeds 4/10. I LOVE photos with shadows of the photographer in them! 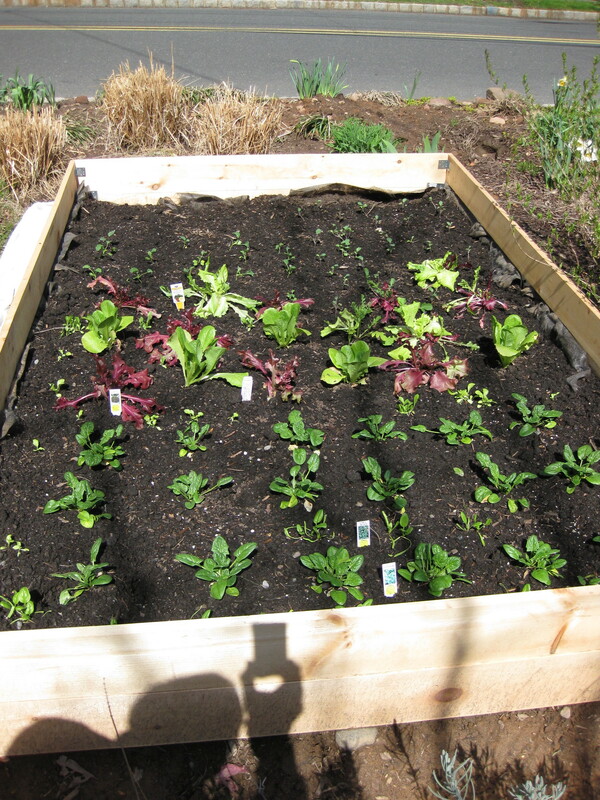 Also, nice raised bed! Ha. And to think, I almost changed the margins to edit out my shadow. Thanks, there will be another one right next to it in a couple of weeks.